Use Wolf ammunition to save big when you want to get a lot of trigger time. These .40 S&W cartridges fire a 180 grain bimetal jacket bullet and produce typical ballistics for this caliber, with flat trajectories and relatively high recoil. 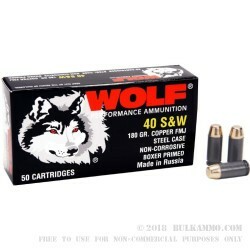 Wolf ammo is loaded in Russia using non-corrosive Berdan primers and steel cases. While not reloadable, the steel cases provide reliable cycling due to their polymer coatings and make a great low-cost alternative to brass cased ammo. Like most Russian ammunition, these rounds have magnetic properties due to their steel components. They may not be permitted at all indoor ranges, so check before ordering if unsure.